Dreams can come true. Many moons ago when Matthias was a child and the Pacific was just a place that existed on a map and in his imagination, he never thought he would make a pilgrimage of sorts to this side of the world. 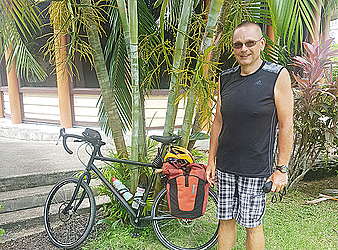 Matthias has been on an eight week trip around the Pacific with Samoa being his last stop and he has found it to be all that he imagined it to be. Dear Tourist find him strolling through the Samoan Cultural village with his bike helmet looking very relaxed and eager to open up to us about how he ended up on this side of the world. “It was a dream of mine, When I was a child in my youth and plus in October of last year we had very bad weather in Germany it was rainy, cold and grey and I thought i would like to go to a warm island and so I remember to my dreams when I was a child and i always looked to maps about South Pacific like Polynesia and Melanesia so I started to organise this travel. Dear Tourist asked Matthias to elaborate on what “Paradise” means to him and others in Europe and it seems that while Matthias was island hopping his ideas on what was paradise evolved each time he left an island. “At first I thought paradise was all about beach, palms, and white sand but its more - much more,” he said. “Fiji was my first trip to the South Pacific, at first I thought Fiji was real South Sea paradise BUT then I went to New Caledonia and I saw that it was a very beautiful landscape, its so beautiful there but very expensive and you can feel a lot of influence from Europe especially from France. Matthias is a free spirit who prefers to see our country side on his bike and stick to local authentic foods rather than buy what’s on offer at restaurants. “I’m travelling with my bike. I’m travelling all around the world with my bike, I have all my luggage on my bicycle and so I travelled around this island. I started last Sunday in Apia to go around Upolu. I travelled around the South Coast, I saw many friendly people and they are in connection with nature. “I like the food here. I tried oka, I like seafood. I also like taro and palusami. “It’s wonderful, it’s quite tasty. All around in the restaurants there are tourists and all they order is chips. I don’t want chips, I can have that at home. Matthias is sad that his eight week Odyssey of the Pacific is coming to an end and he regrets that his English is not very good to say more on his impressions of Samoa but he also admitted that even in his native tongue he would find it hard to describe the beauty of Samoa and that many times when he has sent pictures to his family, they have no words because he did not have the right words to describe. Our German traveller can also tick one more thing off his wish list and it was also another reason why he left Samoa till last.